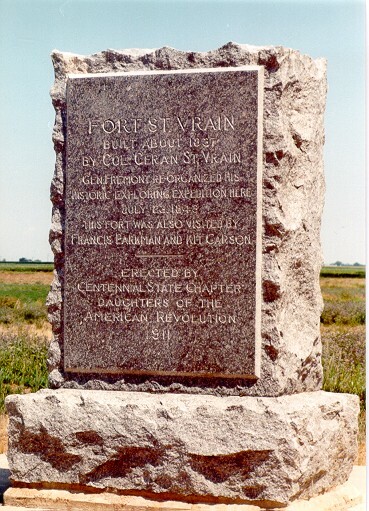 St. Vrain's Fort Pictures & Things! 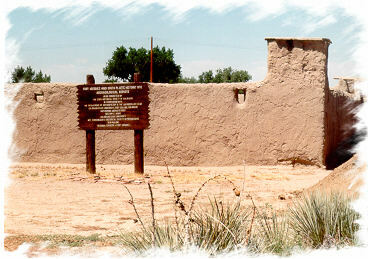 Gen. Fremont re-organized his historic exploring expedition here July 23, 1848. Another shot of the monument looking to the east. The land around the old fort site is farmland for miles, in just about any direction. The Platte River is several hundred yards behind you in this picture. This is Fort Vasquez near Platteville. 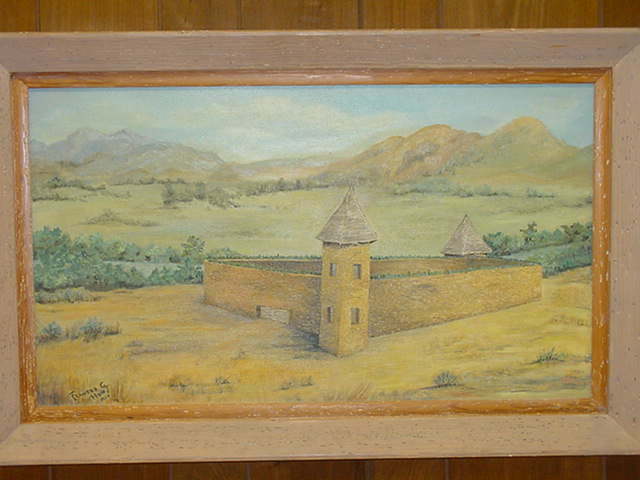 This fort was built before Fort St. Vrain and has been partially reconstructed -- smaller than the original but in the likeness of the original. It is located just south of Platteville right on Highway 85. Looking south, southwest from the fort site and across the Platte river, Wildcat Hill is visible through the trees. 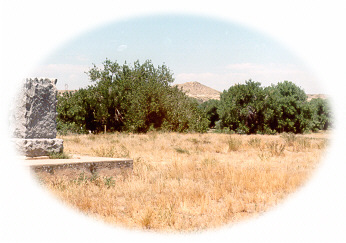 Although Wildcat is a very small hill, it was used as a landmark for locating the fort, especially from the east, in the early days. 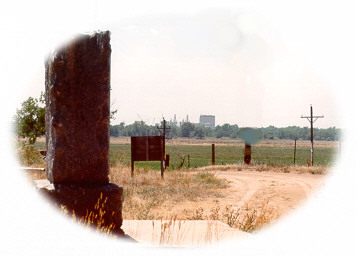 A badly weathered sign, near the monument, tells of an archaeological dig done in 1967 as a join effort between the Colorado Historical Society, Otero Junior College in La Junta and Public Service Company of Colorado. 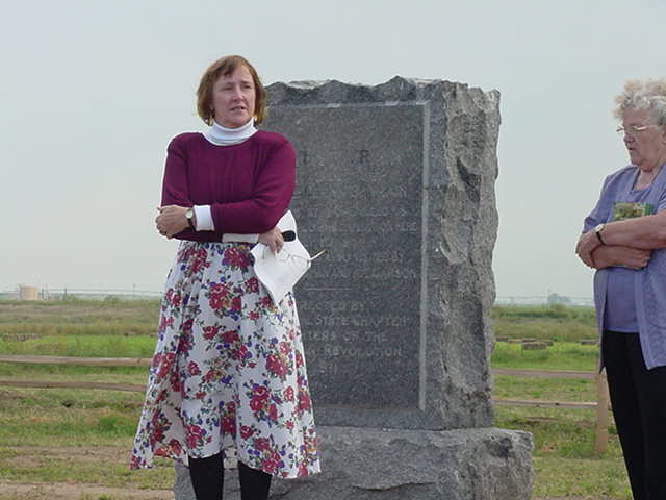 Here my wife, Cindy, is standing next to the monument. 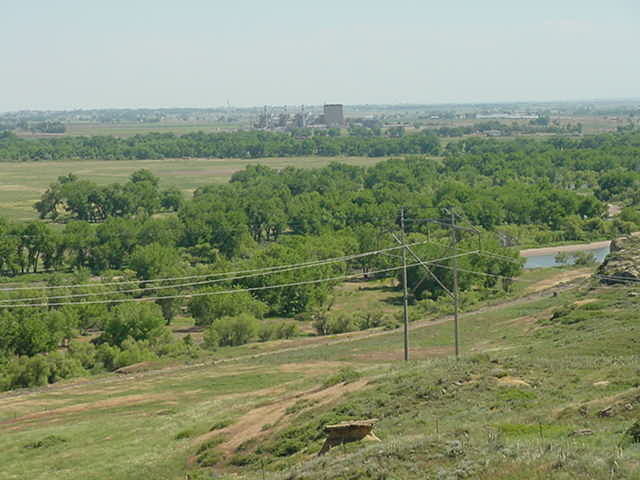 Looking to the south-southwest, the Fort St. Vrain electrical generating station can be scene in the distance. 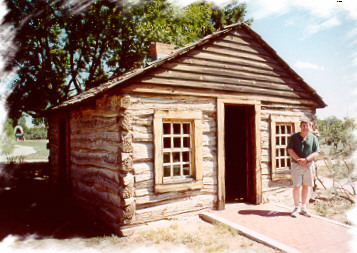 This log building was built by Andrew Lumry in about 1860 near old Fort St. Vrain. It was used as a post office and was later the first courthouse in Weld County. 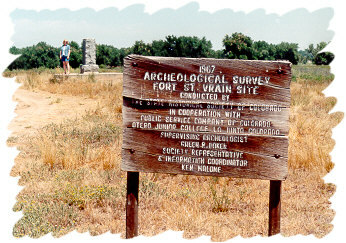 It was moved to Fort Vasquez in the 1930s and later to Greeley. It may be seen today at the Centennial Village Museum in Greeley. It is the oldest man-made structure existing in Weld County. Yours truely standing in front! This photo was taken from the top of Wildcat Hill looking south and a little east. The old historical fort site would be in the trees in the middle left of the photo. The present day power plant named after Fort St. Vrain is in the center background. The Platte River, here a few hundred yards north of the junction with St. Vrain Creek, is visible in the center right and is flowing from right to left (northeast). The mushroom shaped object in the center forground is a sandstone rock outcropping. 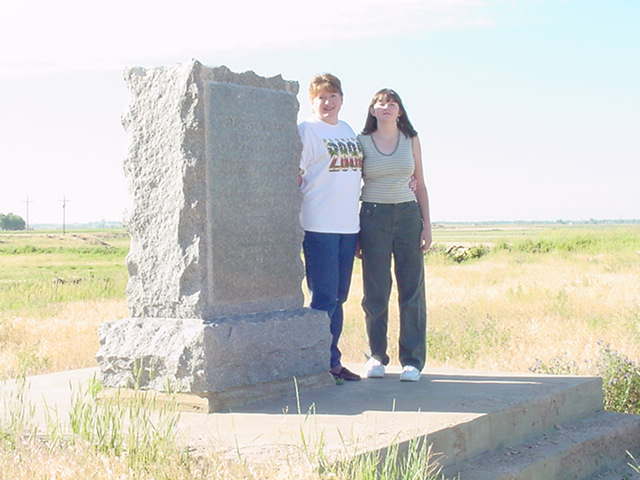 Christine St. Vrain Howard and daughter, Christa, visit the fort monument on June 16, 2001. Christine is the gr-gr-gr-grandaughter of Marcellin St. Vrain and Red or Rel. 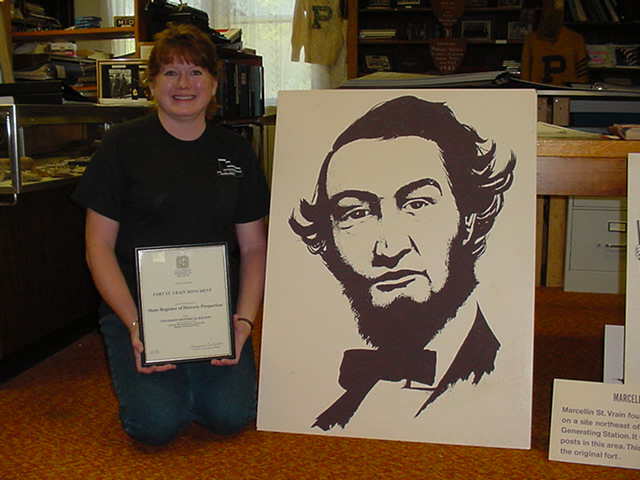 Christine St. Vrain Howard with artwork of Marcellin St. Vrain. This artwork, donated by Public Service Company of Colorado ( now Xcel Energy) from the visitors center at the Fort St. Vrain Power Station, now resides in the Platteville Historical Museum. Christine is also holding the May 16, 2001 document adding the Fort St. Vrain site to the Colorado State Register of Historic Properties. 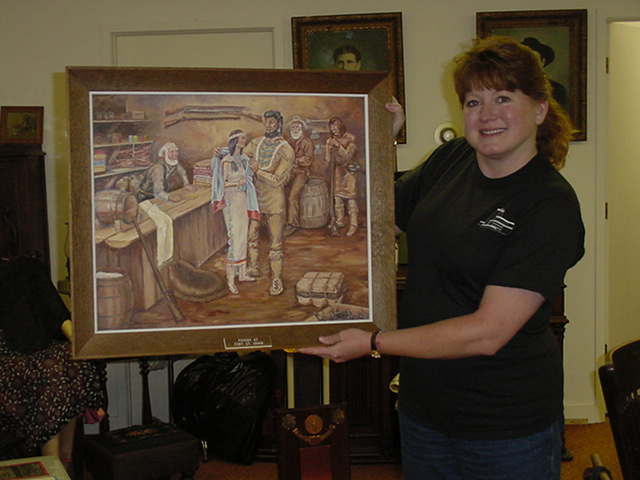 Christine St. Vrain Howard holds the painting entitled "Payday at Fort St. Vrain". This painting, also donated to the Platteville Historical Museum by Public Service Co. depicts Mountain Man, Sol Silver and his squaw. 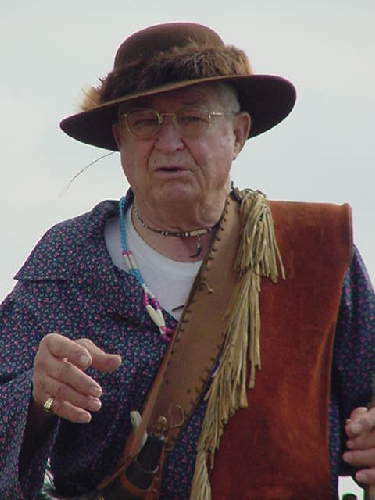 Sol was known to have worked with the horses at the fort and his squaw was known as the best dressed. 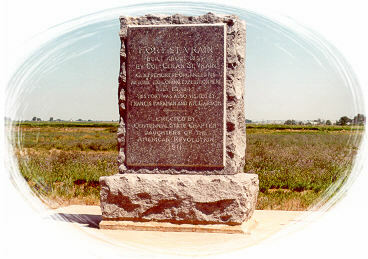 The monument and site were rededicated on September 15, 2001 by the Platteville Historical Society. 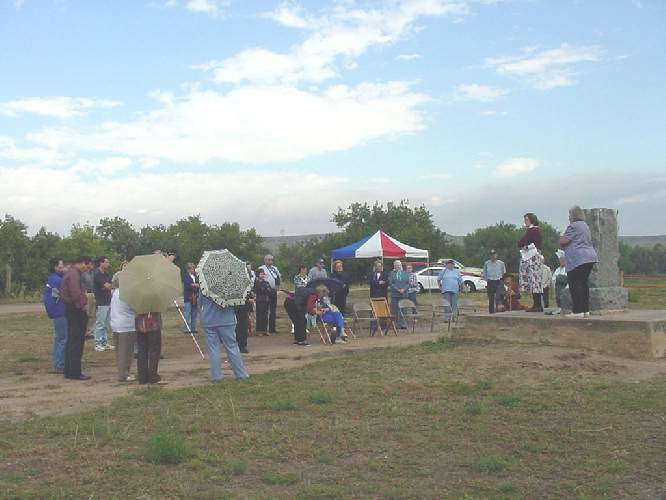 The event recognized and celebrated the recent addition of the Fort St. Vrain site to the Colorado Register of Historical Properties. The contributions of the Daughters of the American Revolution were also recognized. The event was attended by 37 local historians, residents and officials. Here Ruth Garza, past president of the Platteville Historical Society and Diane Brotemarkle, current president, speak to the crowd. Mr. Frank Stewart, local historian, spoke about the contributions of the Daughters of the American Revolution and their contributions here at Fort St. Vrain and elsewhere. Diane Brotemarkle and Ruth Garza. Diane has recently published a book about Fort St. Vrain which is available from the Platteville Historical Museum.